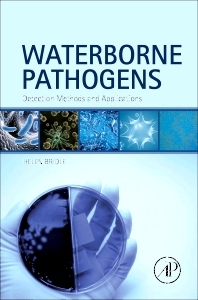 This book gives an overview of advanced emerging technologies for the detection of a range of waterborne pathogens. The book will present existing methodology and highlight where improvements can be made, as well as have a strong focus on applications and the ways in which new technology could be applied in water management. Additionally, it addresses issues of sample preparation (from sampling to concentration and enrichment), a key stage in any detection protocol. Microbiologists, Immunologists, medical and public health professionals, civil and environmental engineers, regulators and managers involved with water quality and monitoring, water utilities, equipment manufacturers, policy and goverment officials, graduate students and postdoctoral scientists. Dr. Helen Bridle holds a 5 year Royal Academy of Engineering/EPSRC Fellowship, exploring methods of detection of waterborne pathogens, at the Institute of Biological Chemistry, Biophysics and Bioengineering at Heriot-Watt University. Prior to starting at Heriot-Watt, she held this Fellowship at the University of Edinburgh. Her PhD was undertaken at Chalmers University of Technology in Sweden and she has also worked as a research assistant at ETH Zurich in Switzerland. She has published 10 papers in high impact academic journals. Dr. Bridle is a Royal Society of Edinburgh Young Academy Member. In 2012, she was a British Science Association Media Fellow at the Scotsman. In the same year she was selected for participation in the Scottish Crucible and the European Science Foundation Junior Summit on Water: Unite and Divide. Dr. Bridle organised the publication of a special issue arising from this junior summit. She is a member of the Journal of Water Resources and Protection editorial board and the Journal of Global Health editorial council.